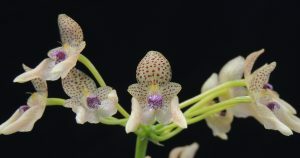 This is a very free flowering and rewarding Bulbophyllum found from the Himalayas across to Vietnam in evergreen monsoon forest from 800 to 2000m. We know this habitat well from our travels in Sikkim with its warm wet summers. The winters are dryer but plants would not experience long periods with no moisture and so keep their rather soft lush leaves. We water plants throughout the year and find they grow well both in pots and baskets. 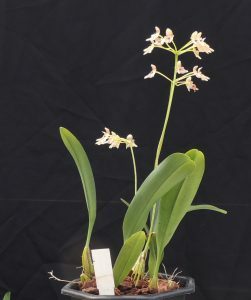 As the range of the plant indicates, the species is not too fussy about temperature and with us grows in any of our sections with minimum temperatures above 10C though it seems to marginally prefer the warmest temperatures of Warm Asia. It may be that our clone has its genetic origins in the lower altitudinal range. As you can see this smallish plant has three spikes out together and flowering twice a year is common.